By submitting an image to @blacktomatotravel on Instagram with #Bermudamyangle or entering your details on this online competition page, you will be automatically entered into the competition. The winner will be chosen at random. By entering your e-mail address and the competition, you agree to being signed up to Black Tomato’s mailing list. The competition is open to those aged 18 or over, excluding employees of Black Tomato Limited and the Bermuda Tourism Authority, their families, cohabitants, agents and anyone connected to the promotion. The closing date for entry to the competition is 23:59 GMT 23rd December 2016. All flights, accommodations and travel are subject to booking and flight availability. Dates will be at the discretion of the tour provider. A limit of only one registration / entry per person will be accepted. The prize is non-refundable, non-transferable, has no cash alternative and has no cancellation value once booked. 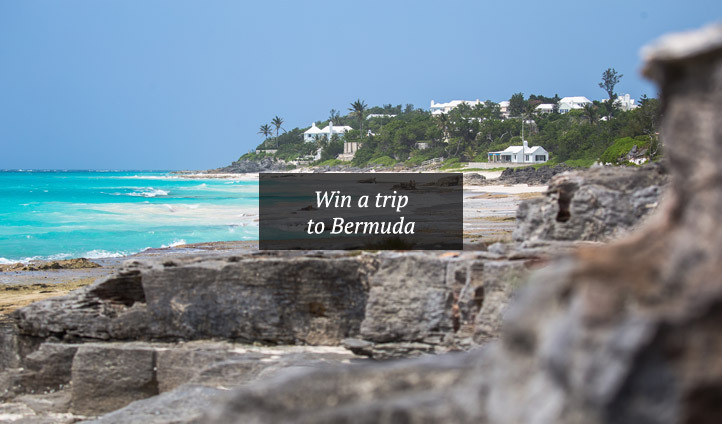 Prize includes return standard class flights for two people and five nights’ accommodations (1 double room) in Bermuda. Does not include spending money or expenses. All prize travel will be subject to the flight carrier’s Conditions of Carriage. Registrations must be completed by the registrant only. Registrations made by any other individual or any entity, and/or originating at any other internet web site or e-mail address, including but not limited to commercial competitions, subscription, notification and/or entering service sites, will be declared invalid and disqualified from this draw. The use of any device to automate the registration process is prohibited. Black Tomato reserves the right to select an alternative winner, remove an entrant or withhold or modify a prize in the event that there are reasonable grounds for believing that a winner or entrant has contravened any term or condition of entry or in the event that Black Tomato has reasonable grounds for believing that the winner or entrant has acted or may act in a manner that could damage the reputation of Black Tomato, any company associated with Black Tomato or any brand or product associated with either Black Tomato or any affiliate company of Black Tomato. Black Tomato shall not be required to provide any explanation in the event of it exercising any of its rights under this paragraph. No responsibility can be accepted for entries lost, delayed, misdirected, damaged or undelivered. Incomplete, inaudible, unsuitable and/or illegible entries will be disqualified. Black Tomato shall not be responsible for technical errors in telecommunications networks, internet access or otherwise preventing entry to any competition. The results of the competition prize draw are final and no correspondence will be entered into. The competition prize winner may be required to participate in any post-event publicity. By registering, all participants will be deemed to have accepted and be bound by these Terms and Conditions. All entry instructions form part of these Terms and Conditions. Black Tomato Ltd reserves the right to change these Terms and Conditions at any time. Our decisions are final and we reserve the right not to enter into detailed responses with you.